Landed at Luni Naval Base, in North of Italy, the first of ten naval tactical transport-configured aircraft for the Italian Navy. Leonardo delivered in January the first NH90 MITT (Maritime – Italian Navy Tactical Transport) helicopter to the Italian Navy. The aircraft was designated ‘MH-90’ by its operator. The handover was performed during an official ceremony held at Luni Naval Base in the presence of representatives and dignitaries from the Italian Navy and industry. Assembled, flight-tested and delivered on schedule from Leonardo’s Venice-Tessera plant, the aircraft is the first of ten MH-90s the Italian Navy will use for amphibious support and special forces operations. The MH-90 combines the main features of the type for land tactical transport duties, such as the rear ramp and mission equipment, together with the features of the naval NH90 such as optimised landing gear and dynamics for ship operations. The MITT variant will add to the NFH (Nato Frigate Helicopter) aircraft in service and on order by the Italian Navy for other specialised tasks of which 23 have been delivered to date. The result of the strong cooperation between the customer and industry, the delivery of the first MH-90 allows the Italian Navy to enhance its capabilities. 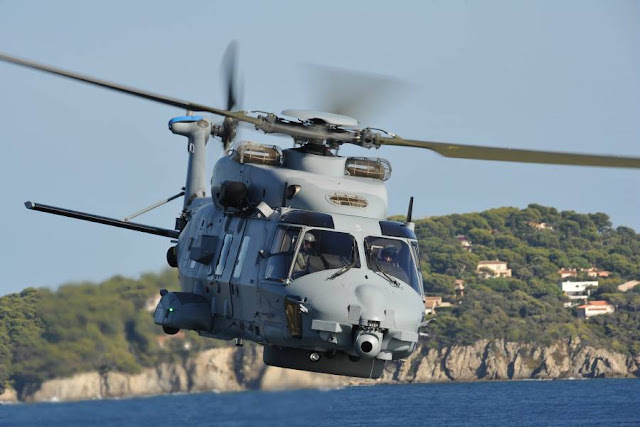 The MH-90 is part of the Italian Navy’s modernization, plans to cope with the ever evolving range of mission requirements and operational scenarios by deploying the most advanced technology available today. its excellent power to weight ratio, and its wide range of role equipment. It features a redundant flyby-wire flight control system for reduced pilot workload and enhanced flight characteristics. Helicopter) dedicated to naval operations. The Italian Navy’s MITT is the first naval utility NH90 combining land and maritime capabilities, adding to the previous standard TTH/NFH versions. Helicopters (62.5%), and GKN Aerospace’s Fokker business (5.5%).